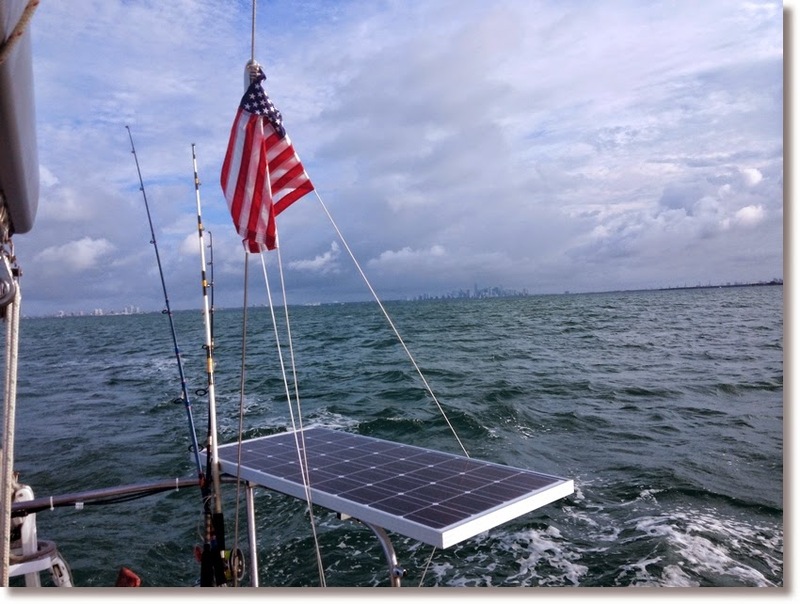 Watching the weather window closely, I sent a message to the family that Clint and I were heading out to cross the gulf stream to Bimini from the Biscayne Bay. (With the implication to call the coast guard if they didn't hear from us by the next evening...) Sarah flew back home to Arkansas a week earlier to begin pursuing shoulder repairs for this last year of multiple dislocations, leaving Clint and I to be a bit more primitive in our approach to the voyage. While crossing the Biscayne Bay late that night, the boat seemed slow and unresponsive. There were long distances between unlit markers in Biscayne Channel through the reef and old fishing houses. Therefore, I also decided that prudence is wisdom and turned north to No Name Harbor (the casual name of the unmarked bay stuck, and now it is official) at the mouth of the Biscayne Bay. The extra mileage meant that we pulled in and had anchor set by about 5AM, and were in bed by 5:30. Not wanting to miss our weather window, I was up at 7:00, I was in the water immediately checking the prop and hull. As I saw fields of tiny barnacles covering the first nine inches below my waterline and down deeper near the aft end, I remembered that this was my first time ever to see the hull floating in clear water. I dove on the prop in Manatee Pocket to prepare Robin for first seatrials, but that water is more akin to coffee, and I had to clean the prop by feel. I shook off the awe struck moment of seeing the lovely curving hull and deep keel suspended a few feet above the sandy bottom, and got to work with a scraper. A dolphin swam in to keep me company, and about a half hour later I had finished the fields of tiny barnacles and was knocking off the last of the larger clusters on the rudder, prop, and cutlass bearing support. By 8AM Clint and I were finishing up espresso and breakfast while warming the engine to leave for Bimini a "second time." The dolphin blew us our last goodbye... taunt? warning? obscenity? You never can tell if dolphins are just being condescending. Daylight is much appreciated when transiting the Biscayne Channel. 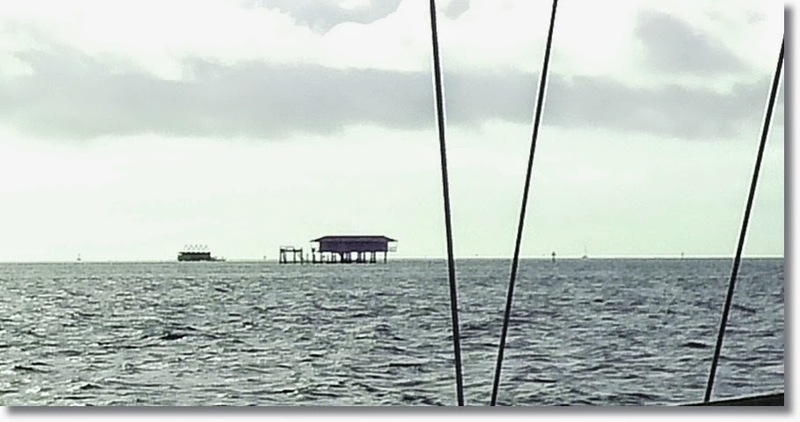 Aside from the markers being visible, we got the main-street tour of the village of Stiltsville. Houses sitting on pilings buried in the bottom of the shallower waters, these served as fishing homesteads and later liquor-serving clubhouses in the 30's, and into the 1970's remained a hot spot to hit in Miami. Deeded to the public parks in 1985 and hit by Hurricane Andrew in 1997, only a few remained standing. In 2003 a new deal was struck that eventually allowed preservation and development of the area. You can't see it from the pictures, but there are a couple dozen well kept houses there now that I suspect are vacation rental properties, just a few cozy miles from shore. A few miles after passing the Fowey Rocks light the swells grew to splash-you-in-the-cockpit large and thunderstorms engulfed the Miami skyline off our stern. I was glad to see the city astern, but concerned about the state of its weather. I hoped that my last weather report that morning would hold true, because Clint was already motionless in the fetal position on the dinette, post stomach-emptying seasick. The sails only had one reef each, and constant hands-on tiller steering while motor-sailing was the order of the day, preventing me from being able to tie in another in the tumbling seastate. During the next couple hours of single handing in front of the storm, the wind kicked up to 35 knots a few times. Robin was on the port tack, motorsailing hard into the south east wind. Robin stood up to the breeze well, though I wish I had been able to put the second reef in. At some point in the middle of the stream, when our best-able course was still taking us 2 points (22.5 degrees) farther north due to the ripping current, the wind suddenly clocked north 90+ degrees and backwinded the genoa hard against the mast. I was suddenly being shoved to starboard and a dead stop in a rapidly deteriorating "hove to" position against the current. At that same moment, the engine bogged down 1000 RPM and black smoke billowed from the exhaust. I thought I had blown something critical in the engine, and so reluctantly backed down the throttle on the lifeline engine keeping my course. With the motor whimpering away at idle, the wind and waves were quickly pushing me farther to starboard, threatening to turn the situation into the worst sort of accidental gybe (turning your back to the wind), complete with flying boom, and possible broaching from sheets being set tight for beating. I blew both the main and genoasheet as fast as I could get my hands on them, and regained headway on a starboard tack with the main. Then, holding course with my foot and winching in the genoa on the starboard side, I was back sailing on course. The engine had stopped smoking, and I slowly pushed the revs back up constantly looking and listening for smoke or noise. I hoped the sudden engine load of stopping dead in turbulent current and waves must have slowed the revs, dumping excess fuel to cause the smoking incident. The wind shift didn't last long, returning to the south east about ten minutes later, but I was ready this time, and it only took a few seconds to reset on the port tack. The rest of the crossing was "uneventful" but still a ride through god's washing machine, with every fifth wave washing the deck and every 20th dousing me in the cockpit. I came to know why the dodger is called the "dodger", ducking behind it every time my forward view turned into a wall of water. When Bimini had come in sight, the waves had died down with the current, and thinking too many times that I wish I was carrying less sail, I decided it was time to challenge myself and put in a second reef while still maintaining headway and steering. I carefully eased the mainsheet and tightened the genoa sheet to better balance the helm. 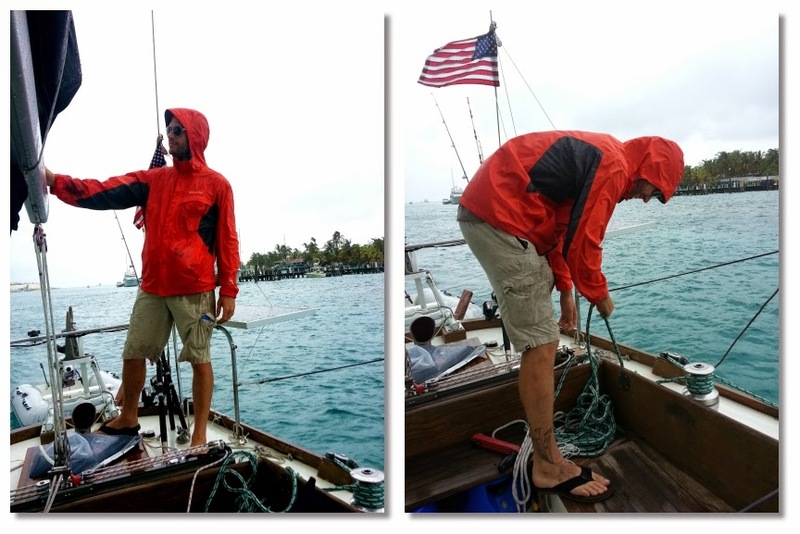 After balancing, Robin only needed a few hip-bumps of the tiller to keep on course as I quickly dropped the main halyard about 8 feet, winched the second reefline tight, re-tensioned the main halyard, and hauled back in on the mainsheet. Robin stood up a few more degrees and picked up a quarter of a knot as well. Clint's sickness had passed with the heavy seas and I woke him with the reefing process. During the crossing, Clint returned to deck a few times for about a half hour at a time, but spent most of the Gulf Stream crossing huddled on the dinette in that non-sleeping state of motionless total seasick vomit exhaustion. I've seen warriors laid out this way many times, on boats, helicopters, airplanes, humvees and more, no shame in it. Clint came topsides to see Bimini come over the horizon only 8 miles north of our target. We easily sailed the last few hours into the harbor in North Bimini and dropped anchor just up the channel from Big Game Marina shortly after sunset. We could check into customs in the morning, for that moment called for rum drinks all around before finally bringing an end to our 36-hour superday.